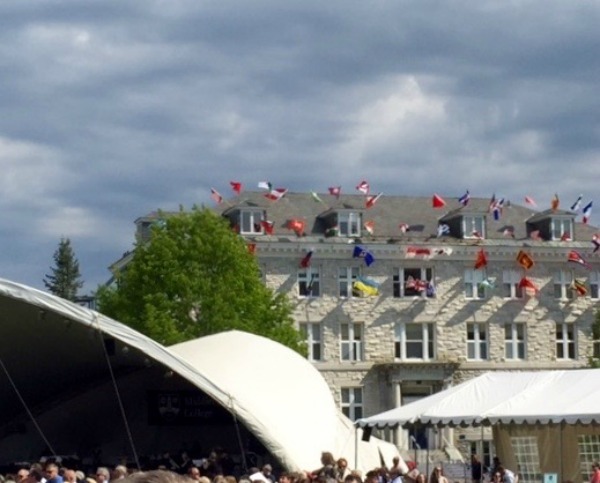 We just attended the 214th Commencement of Middlebury College where Julia Alvarez, a classmate of mine at Middlebury and a 1971 graduate, gave the commencement address. Julia is a beloved poet and author of novels, essays and children's books. She is a native of the Dominican Republic and though born in the United States, spent most of her childhood in the DR. Her family was forced to flee the dictatorship of Trujillo and move to the U.S. in 1960. Julia is writer in residence at Middlebury College and has made Middlebury her home. Among her many honors is the National Medal of the Arts which she received in 2013 from President Obama. You can click here to hear her whole speech and see other commencement highlights. I was so moved by her words today. She said that she wanted to give the graduating seniors a backpack of supplies in the form of stories to take with them as they left. She said that she is a story teller and that stories are her currency. I love that. Julia asked students to spend their lives giving themselves whole heartedly to what they love and to always know that what they do is soulful work, soul nourishing rather than soul depleting. She told a story about a woman who wanted to touch the stars and when she finally did, Father Sky asked how she could be so tall. She said that she was standing on a lot of people's shoulders. Julia reminded us to feel great gratitude, for we are all made of the people we have learned from and the people who have helped us along the way. Julia told us of Mayan weavers who begin every project asking for the patience and the intelligence to look for the true pattern and she encouraged us all to do this in whatever work that we are engaged in. She told a story of learning from the people of the Haiti, the poorest country in this hemisphere. She said that they received what they needed by sharing and that we all receive what is most important by sharing what we have. She quoted Toni Morrison who said that "the function of freedom is to free someone else." Julia has written many books including my favorites, In the Time of the Butterflies, A Wedding in Haiti, A Cafecito Story about the sustainable coffee farm that she and her husband, Bill Eichner established in the Dominican Republic, and The Best Gift of All: The Legend of Vieja Belen which my three year old grandson, Asher asks me to read to him over and over again. Read Julia's books if you haven't. You will learn from her wisdom, her humanity and her beautiful story telling.